You’ve been in New York a while, which means you’ve checked enough items off your bucket list that you no longer feel the need to fight with half of humanity for enough space to lay down a blanket in Central Park on Memorial Day. Sure, it’s sunny, and you’ll get in some time outside, but all you really want is the day off of work and a burger. Let Seamless save you the trouble of running out by letting them deliver you one of the best burgers in New York City. Oh, wait, you thought you had to dress up and head downtown to get a quality burger? Think again. We teamed up with Seamless, that crusher of stubborn cravings, to find the best burgers in New York City that you can get delivered right to your door. 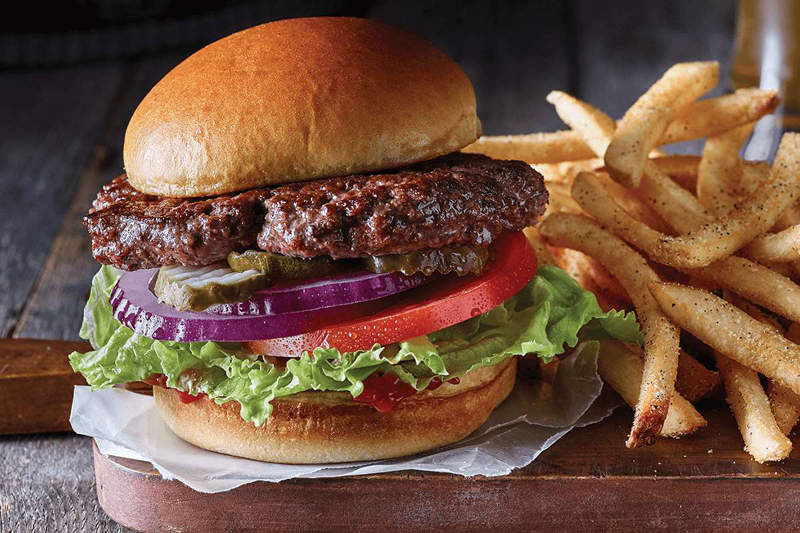 So crank up the AC, make sure you have the Seamless app (which is available for Android and iOS) and start sifting through the savory options — with burgers this delicious, it might take a while. Forget all those “for” caveats. These aren’t just the best burgers in New York City “for delivery.” Seamless sifted through their data, including honest reviews and ratings from diners just like you, to find the best of the best. But these meaty meals don’t just have to taste delicious; they also have to sail through the delivery process, on time and still piping hot. So find the burger spot that delicious to your apartment, and rest assured that the cheese will still be gooey when you hear the doorbell ring. You’ll get a mini Memorial Day spread with any of the burgers off this menu. They come with a side of coleslaw and a pickle and boast mouthwater toppings from a gooey fried egg to thick-cut Canadian bacon. Many diners agreed with this reviewer, who praised her order in three different areas: “quick delivery order was correct and the food was excellent.” Overall, it’s one of the best burgers in New York City if you need that classic diner comfort delivered right to your couch. They’re not messing around here. In fact, mark this restaurant on the list of best burgers in New York City as your go-to if you want almost endless options. The Greek burger even comes topped with feta cheese, tzatziki sauce and a slice of gyro meat. Many reviewers gave this diner high marks for “super fast delivery,” and one called out that “it’s good and affordable af.” So if you want one of the best burgers in NYC without dropping major dough, you now have a go-to. Classic burger or speciality? You better decide going in because the options will leave you torn and ravenous if you don’t. Their speciality burgers, named after Manhattan neighborhoods, boast less common condiments and toppers like blue cheese, 1000 Island sauce, portobello mushrooms and chipotle honey sauce. “Bowery burger was delicious! Will order again,” one satisfied customer wrote. Another suggested dessert: “The burgers are amazing and the Oreo shake is incredible.” Hungry yet?